- The yield and nutritional quality among other important characteristics are equal or superior to those of wheat. - It grows well in poor soils and resists typical pests and diseases of rye. In Spain, its cultivation is becoming more important. In cattle breeding areas like the countryside of C�diz, they use grazing in winter due to its great regrowth capacity (higher than barley and oats). In the summer, quite a lot of grain is harvested. Sometimes they can produce up to two harvests of green forage in winter and early spring. - Soil: Triticale has shown that it can adapt well to acidic soils although it is certain that it is not demanding in terms of soil condition. It prefers relatively compact soils, i.e., with little porous structure especially in times of germination. - Camarma (INIA, 1985): medium, late or very late cycle. Average production capacity. Very high adaptive capacity. - Misionero (Semillas Fit�, 1987): medium cycle, semi-early. Average production capacity. Resistance to yellow, black and brown rust. - Senatrit (SENASA, 1994): medium cycle, medium late. Very high production capacity..
- Tritano (Semillas Batlle, S.A., 1988): medium cycle, semi-early. Good production capacity. Moderate sensitivity to yellow rust. Resistance to leaf rust. Sensitive to stem rust. - Galgo (Verneuil, 1996): semi-early cycle, dual purpose. - Titania (IRTA): cycle longer than Tritano. Better than Tritano with regards to specific weight and weight of thousand kernels. - Trujillo (Andalusia Research Service, 1987): medium long cycle, early. Good production capacity. Very high adaptive capacity. - Trijan: Long cycle and dual release. High production capacity. - No� (Semillas Agrar): very high production capacity. Resistance to lodging and shelling. Very resistant to diseases. - Harvest of grain (May-August): It is very important to determine when the grain is in optimal conditions to be harvested. It should be harvested when its moisture content is about 15-16%. This moisture indicates that the grain is in "commercial maturity". If the harvest is delayed, the moisture content decreases and this favours the shelling, the breaking of spikes and can even cause insect attack. - Harvest of green fodder: The purpose of this harvest is to get as much fodder as possible but with a high nutritional value. 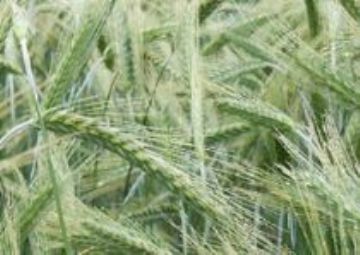 Triticale is a plant with hard stem so proper equipment is needed for cutting, splitting and storing the harvested forage. - Scald (Rhynchosporium secalis): It causes foliar spots. In more severe cases, it can also be affected the pods, glume and even the ears. - Rust (Puccinia striiformis and Puccinia triticina): Triticale is practically resistant to this disease. It affects the leaves. - Cladosporium spp., Alternaria spp. : They cause leaf spots. - Sunburned or shrivelled grains: This physiopathology causes incomplete filling of grain and thus it remains lightweight and wrinkled resulting in significant economic losses. The onset of sunburned grains in triticale is related to the existence of imbalances between plant evapotranspiration and water intake. Usually, elevated temperatures for several days along with low humidity, often favour the occurrence of this physiopathology.